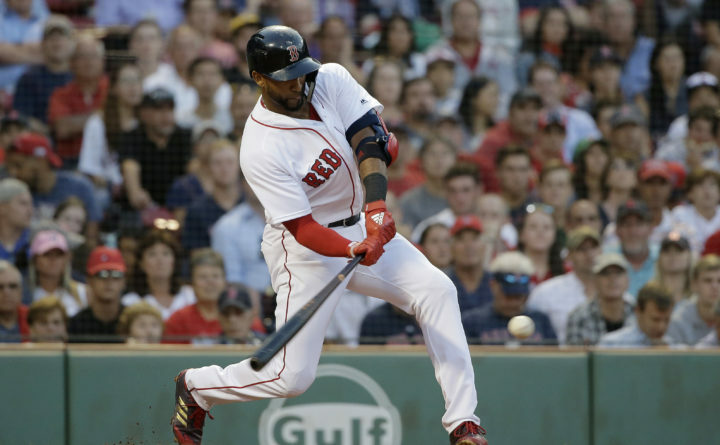 Boston Red Sox's Eduardo Nunez hits the ball off Texas Rangers' Bartolo Colon during the second inning at Fenway Park in Boston on Wednesday night. Nunez reached on a fielding error and a run scored. DANGER ZONE: The Rangers had difficulty with three different popups in shallow center field. NO BENNY: Red Sox left fielder Andrew Benintendi finished second in the voting for the final spot on the AL All-Star roster, losing out to Seattle shortstop Jean Segura. Benintendi had two hits on Wednesday for his sixth straight multi-hit game. He also scored for the sixth game in a row but failed to double, ending a streak of five straight games. FOR SALE: Sale made his 200th career start. … It was the 11th time in his 20 starts this season he gave up one run or none. … It was his ninth game this season with at least 10 strikeouts and his fifth straight with at least 11 strikeouts and no more than one walk. … He also made a nice play to end the sixth inning, stabbing a hard bouncer by Odor and throwing to second to start a double play. TRAINER’S ROOM: Rangers: Deshields left the game after diving for Nunez’s bloop in the sixth inning. He was evaluated for neck and shoulder problems. Later the same inning, Odor talked to the training staff after stretching awkwardly to hold the bag on a force at second. UP NEXT: Rangers: Off Thursday, visit Baltimore on Friday, when LHP Cole Hamels (5-6) faces RHP Alex Cobb (2-11).